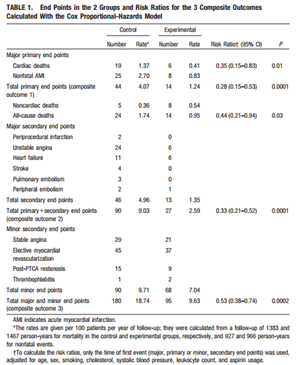 605 people (~90% male) under 70 years old who had previously had a heart attack were randomised to a high (~0.6% TE) alpha-linolenic acid (ALA) Mediterranean diet (N = 302) or to the usual post-infarct prudent diet (N = 303). There were no significant difference between the groups at baseline . 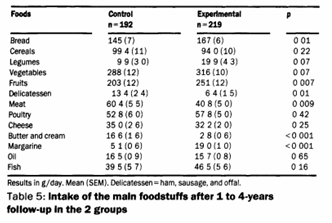 But let’s assume the results are an accurate reflection of the dietary intervention, particularly given that even if the low risk ratios are due to chance, the upper limits of the confidence intervals would still predict a pretty decent dietary effect. What then is the take home message of this study? The authors suggest the nutrients involved were increases in vitamins C and E, lower omega 6 and higher omega 3 and possibly a higher intake of certain amino acids, micronutrients and phytonutrients although the latter three weren’t measured . 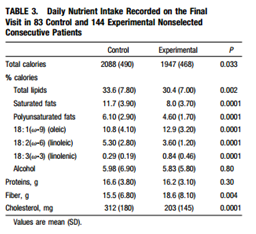 Due to the multifactorial nature of the intervention it is clearly inappropriate to use this trial as evidence for specific foods or nutrients such as SFA, MUFA and PUFAs. I think this trial is a good example that there is more to CHD than the standard risk factors such as HDL-C, LDL-C, BMI and blood pressure (as you don’t need changes in them to have an effect), but it shouldn’t be used to argue that those factors are irrelevant. Perhaps it’s evidence that many minor differences can add up and produce a substantial effect, but I’m not sure about the degree of that.